Fathom Events, TCM and Warner Bros. present When Harry Met Sally... for a special 30th Anniversary showing coming to select cinemas featuring exclusive insight from Turner Classic Movies. 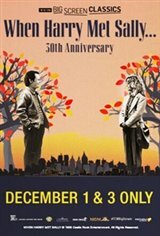 Burns (Billy Crystal) and Sally Albright (Meg Ryan) meet when they share a car on a trip from Chicago to New York right after both graduate from college. As the two build their lives and careers in Manhattan, they find love and heartache--with other people--but their paths continue to cross and their friendship continues to grow over the years ... until they confront the decision whether to let their friendship develop into romance.